The Edo chapter of the All Farmers Association of Nigeria (AFAN) has commended Wife of the state Governor, Mrs. Betsy Obaseki for empowering women through Agriculture Initiative, saying it would boost food production in the country. The state chairman of AFAN, Chief Emmanuel Odigie gave this commendation during an interview with newsmen in Benin on Thursday. 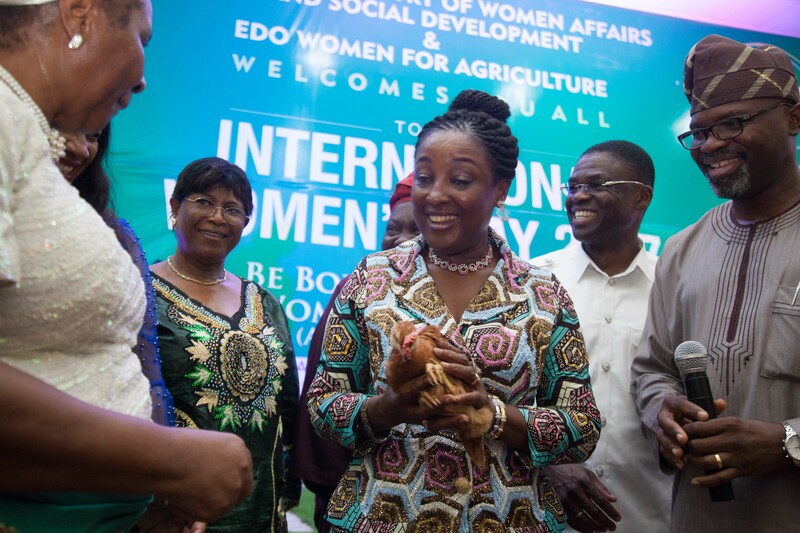 It would be recalled that Edo Women for Agriculture Initiative was recently launched by the wife of the state Governor, Mrs Besty Obaseki in collaboration with the Bank of Industry, Investment Trust Company (BOI-ITC) to engage women in agribusiness ventures. The initiative kicked started with the training of 500 widows on poultry production who were empowered with 20,000 chicks and feeds to start production. Odigie said that the initiative was a welcome development as the role of women in agriculture production could not be overemphasized. He said that the initiative would not only serve as empowerment for the women but also make them employers of labour. ‘’The poultry initiative is laudable as the demand for poultry products such as eggs and chicken in the country is very high. If the producers are able to remain in business, it will lead to job creation for more peoples who will be involved in the marketing and sales of the poultry products. ‘’It will also open new markets for poultry products in the state and discourage quest for imported frozen poultry products’’, he said. He also suggested the incorporation of other lucrative agribusiness ventures into the initiative. He said, “Arable crop production should be incorporated into the agriculture programme as there are lots of arable land in the state. Snailery production is also a profitable business; with less than N10, 000 one can start a small scale production”. He, however, suggested that the farmers’ association in the state should be carried along in the execution of such initiatives as it was the umbrella body for all farmers in the state.